Folic acid has a wide variety of functions within the body, for example helping to maintain normal blood formation, psychological function and the function of the immune system. Like other B vitamins, folic acid has a wide variety of functions within the body, for example helping to maintain normal blood formation, psychological function and the function of the immune system. However, before it can do any of these it has to be converted to its active form by a series of biochemical steps. 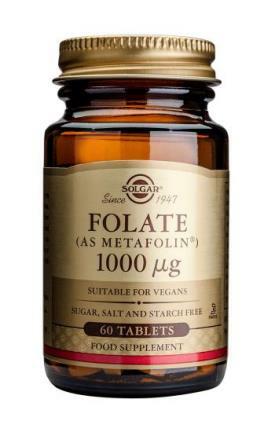 Metafolin® (L-methylfolate) requires no conversion because it is bioidentical to the bio-active form. In other words, it is ‘body-ready’. This may be useful for individuals whose bodies have difficulty converting folic acid to its active form. SUGGESTED USE: As a food supplement for adults, one (1) tablet daily, preferably at mealtime, or as directed by a healthcare practitioner. Why Buy Solgar Health Supplements and Vitamins? Solgar has been providing innovative, top-quality and wide-range of health supplements to consumers since 1947. Solgar are driven by the science of nutrition and use state of the art manufacturing facilities to provide consumers with the highest quality vitamins, minerals, botanicals and food extracts available. Solgar’s mission is to enhance the total health and well-being of consumers. They strive to achieve this by exclusively distributing our products to knowledgeable retailers worldwide who receive our on-going comprehensive supplement training and nutrition education. These retailers can then guide consumers through the wide range of health supplement choices available. Solgar's manufacturing and quality control laboratories guarantee that every batch of health supplements meets our ‘Gold Standard' for purity and potency, plus Solgar's own distribution facilities ensures complete accountability at every stage of production. Since 1947 Solgar has had one mission: To provide consumers with the highest quality health supplements sold by educated retailers to help promote optimal health. Solgar's attention to detail at every stage from manufacturing to distribution has enabled us to set, maintain and raise the ‘Gold Standard' for quality and attention to detail in a constantly evolving and competitive industry. We all know that we can make small changes to make big differences and Solgar is no exception. With this is mind, at the Solgar manufacturing facility, they use purified water and friendly ‘green' cleaners when preparing equipment between manufacturing batches. Our facility is also equipped with noise reduction baffles and an exhaust filtration system to help minimise the environmental impact. They even have their own ‘Green' quality checking of collateral and media material, making sure our office papers and marketing materials are all produced as environmental grade/recycled papers. Solgar is distributed world-wide in over 50 different countries, with affiliate offices in the U.K., Spain, South Africa, and New Zealand. SOLGAR VITAMIN AND HERB is a global company with global concerns, not least the impact we all have on the environment both professionally and personally. This is why Solgar go to such great lengths to use glass bottles that they guarantee are 100% recyclable. These bottles also maintain the potency and stability of our nutrients and herbs. The packing materials they use for deliveries are recycled egg cartons and newspaper off-cuts of recycled paper that we source from local companies. Even the Solgar boxes are made from environmental grade cardboard. All packages from Solgar arrive at Vanderbell Health packaged in re-usable packaging securely packed as shown above. They always appear to have taken great care in their packaging to the extent that we often find them more difficult to unpack, but this is entirely to the benefit of the customer. You will be able to tell form the Solgar Supplements that you buy how sturdy and well made the glass containers are. Solgar is renowned world-wide for its innovative, science-based health supplement line, and our expert-led R & D department ensures that every product is thoroughly researched. Indeed, Solgar also supports and encourages research on both existing and potential new products by donating funding and product to existing research studies. Solgar's state of the art manufacturing facility is completely up-to-date in both design and function, complying with health supplement Good Manufacturing Practice (GMP) and meeting pharmaceutical standards for machinery, procedures, quality control and environmentalism. This actually exceeds the standards required by the health supplement industry but ensures that Solgar quality is not compromised at any time during the manufacturing process. Indeed with our own quality control laboratory and distribution facilities, Solgar can guarantee accountability throughout the entire process. Solgar strives for excellence and has the highest standards for quality. We employ a rigorous system of quality control measures within our on-site laboratory (a rarity within the industry) to test health supplement products at every stage of manufacturing, from raw material to finished product. All raw material entering Solgar's manufacturing facility is subject to stringent tests to ensure they are of the highest quality and purity. Any raw materials not meeting our exacting standards are immediately rejected and returned to suppliers. No product leaves their facility without meeting their ‘Gold Standard' for excellence. USP Water Purification System. Solgar's facility benefits from a state-of-the-art USP reverse osmosis water purification system. This $1 million filtration technology is not required by Good Manufacturing Practice but is required by Solgar as part of our overall commitment to manufacturing excellence. HEPA Air Filtration System. As part of Solgar's commitment to purity, this air filtration system is utilised in our manufacturing facility to filter all the air that circulates, removing 99.9% of all airbourne particles. Samples of both air and water are also routinely tested in our quality control laboratory. Workers at Solgar's manufacturing facility routinely disassemble and clean every piece of machinery after each formula change. The equipment is broken down into hundreds of parts and may take up to eight hours to clean and reassemble. In fact many of Solgar's machines spend longer being cleaned than they do making products. They also use food-grade, environmentally friendly cleaners to sanitise equipment between batches. Solgar selected KOF-K Kosher Supervision to certify our products. This international organisation follows the strictest laws of the kosher observance. Solgar chose the Halal Food Authority (HFA), a U.K.-based organization that adheres to the strictest laws of Halal, to certify our products. Solgar was one of the first in the Natural Products Industry to stop using shellac, a solvent-based tablet coating agent, and to introduce a natural, water-based coating instead for all of our coated-tablet products. This natural, water-based coating improves disintegration and dissolution, providing better absorption of the nutrients. Solgar is known for 100% recyclable, non-leaching, non-porous, and odorless glass bottles. Although these "old style" medicine bottles are more expensive, Solgar uses them because as part of their commitment to quality, they protect against heat, light, and moisture, thereby preserving nutrient potency. To help retailers, doctors, pharmacists, journalists and consumers understand how supplements work, Solgar provides a team of nutritional experts to answer technical questions by phone, mail or e-mail. Solgar is committed to distributing our products through independent health food retailers where consumers can find the best products along with the best nutritional advice and service. This is another way of ensuring the integrity of our products. SOLGAR VITAMIN AND HERB has been committed to its CarbonNeutral® programme [in partnership with the CarbonNeutral® company] since 2000 and has planted approximately 10,000 tree saplings to counter its carbon emissions for its deliveries and company cars. In 2005 Solgar decided to expand its CarbonNeutral® initiative to include investments in carbon credit offset projects and has since invested in projects across the globe, including wind farms and solar energy schemes.